B. 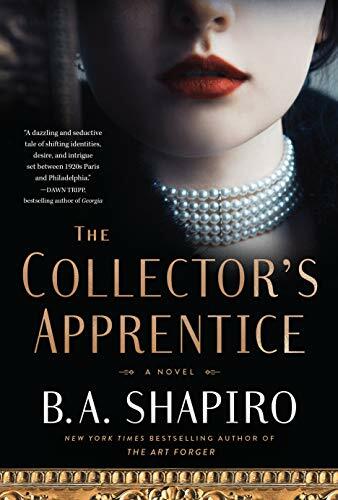 A. Shapiro delivers another dose of art history, wrapped tightly in a thriller set in Paris and Philadelphia in the 1920s. Nineteen-year-old Paulien Mertens is banished from her home in Belgium after her parents wrongly accuse her of being in cahoots with her fiancé, George Everard, in a swindle that causes her father to lose his coveted art collection and his fortune. Paulien flees to Paris and assumes a new identity under the name Vivienne Gregsby. Her degrees from the Académie Royale des Beaux-Arts and the Slade School of Fine Art in London and her experience at the Whitechapel Gallery lands her a position as apprentice to art collector Edwin Bradley. Her intention is to earn enough money to purchase and return her father’s collection, which Bradley has acquired for his museum. When Paulien discovers that the story of her involvement with a scam artist has followed her to Paris, she realizes she needs more than a new identity to keep her from arrest and destitution. Keeping a low profile, she successfully assists Bradley in amassing an enormous art collection. Eventually she earns his trust and becomes his partner, a teacher at The Bradley School of Art, and the sole heir to his fortune. Despite Vivienne’s careful attempt to hide her past from Bradley, she risks everything she’s work for when she becomes involved a clandestine love affair with Henry Matisse. The novel is loosely based on the lives of art collector Dr. Albert Coombs Barnes and his assistant Violette de Mazia, as well as the history of the Barnes Foundation in Merion, Pennsylvania. Today, the foundation’s holdings, which includes works by Renoir, Cézanne, Matisse, Picasso, Modigliani, Monet, Gauguin, Van Gogh, many of the Old Master painters, leading American artists, as well as art from Africa, China, Greece, and more are worth more than $25 billion. The Barnes Collection was relocated in 2012 to a new site on a 4.5-acre campus in downtown Philadelphia. Shapiro takes liberty with the actual story, creating an enticing page-turner. The book goes back and forth in time over eight years between Paulien/Vivienne’s point of view and that of George Everard’s, so readers are given both perspectives as the characters paths continue to cross. Shapiro does an extraordinary job merging fact with fiction, bringing not only Henry Matisse and the real Edwin Bradley into the story, but Gertrude Stein and her consort of post-Impressionist artists. With Shapiro’s attention to detail and intricate plotting, it’s worth checking out two of her other novels, The Muralist and The Art Forger.